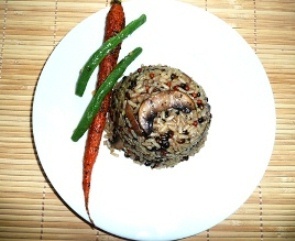 You can also make your own blend with brown rice, barley, quinoa and lentils if you wish. 1. In a warm non-stick pan,add olive oil. 2. Saute bayleaf with cloves and all-spice for a minute. 3. Then add finely chopped garlic and saute for another minute. 4. Add your mushrooms, oregano and basil. Cook for 2 minutes or until mushrooms soften. 5. Blend in the rice medley. Add the rest of the olive oil and roast for 2 minutes. 6. Pour 21/4 cups of water and bring it to boil. Then reduce the flame and let it simmer for 30 minutes. If you think that the rice needs more water add the rest of the water and simmer for 5 minutes. 7. Turn off the flame. Let it rest covered for 10 minutes. 8. Serve it warm with grilled tofu/ beans or any kind of protein.